Long time no post! Sorry for neglecting my blogging duties, I have been having a little too much summer fun. I plan on catching up this week, so sorry in advance if you get a lot of Juicy Bites in your in box. We had a fun and busy weekend and I wanted to finish it off with a nice family dinner yesterday. The kind where we actually eat at the dining room table and I light the candles. It was a really nice mellow end to a fun summer weekend. To me, a Sunday dinner is all about comfort food. 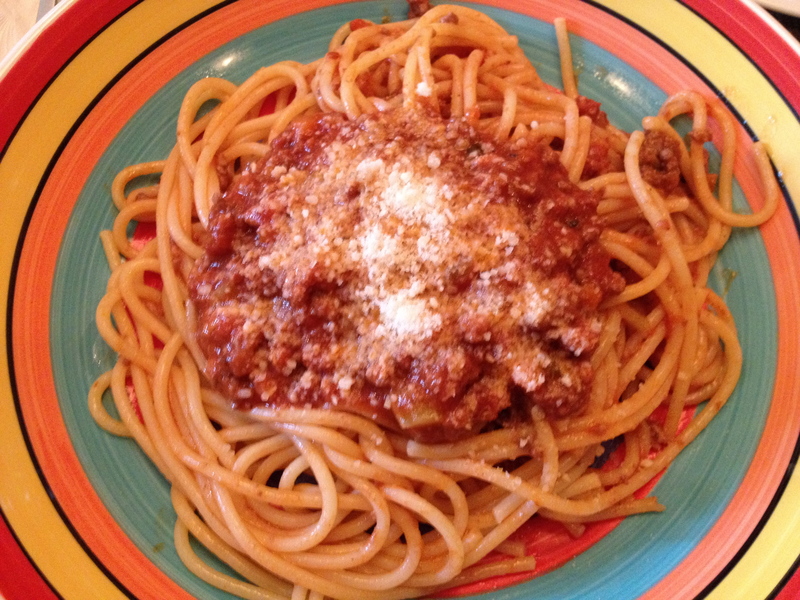 One of my family’s favorite comfort foods is spaghetti with a good meat sauce. 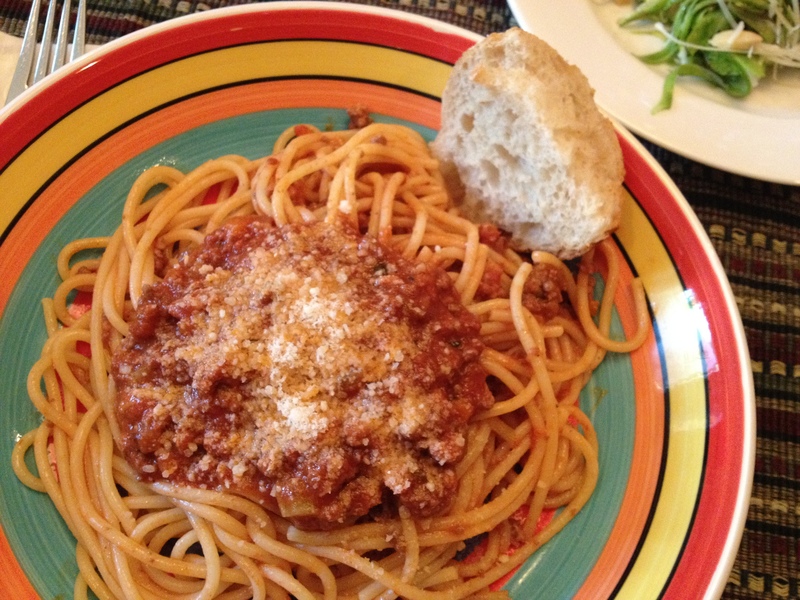 For this Sunday dinner, I decided to go with a bolognese sauce instead of my usual meat sauce. 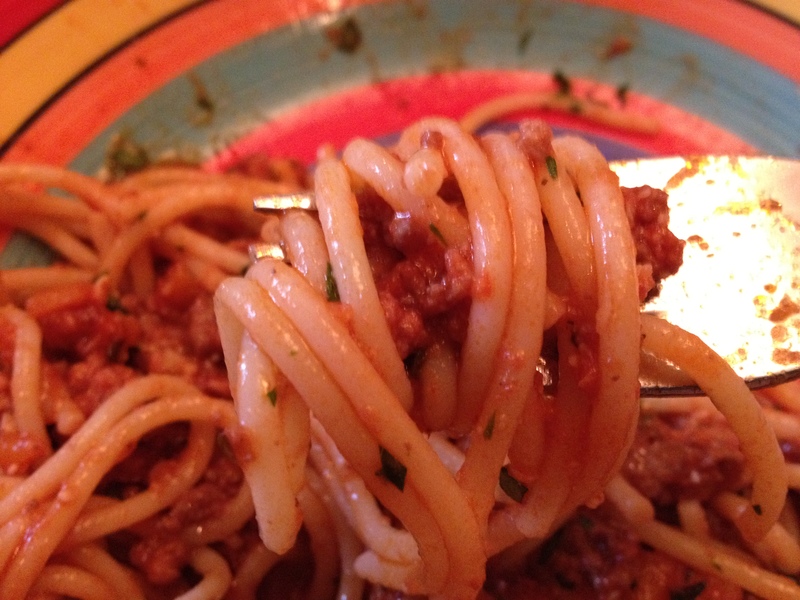 Bolognese is thicker, meatier, and richer than a basic meat sauce. It’s usually a combo of beef, veal, and pork and is finished with milk or cream. It’s more of an Italian “stew” than a sauce. I searched around and settled on this recipe from Emeril Lagasse. I stuck pretty close to his, with just a couple of changes. This recipe starts with some diced pancetta or bacon. I used bacon because it’s what I had on hand. 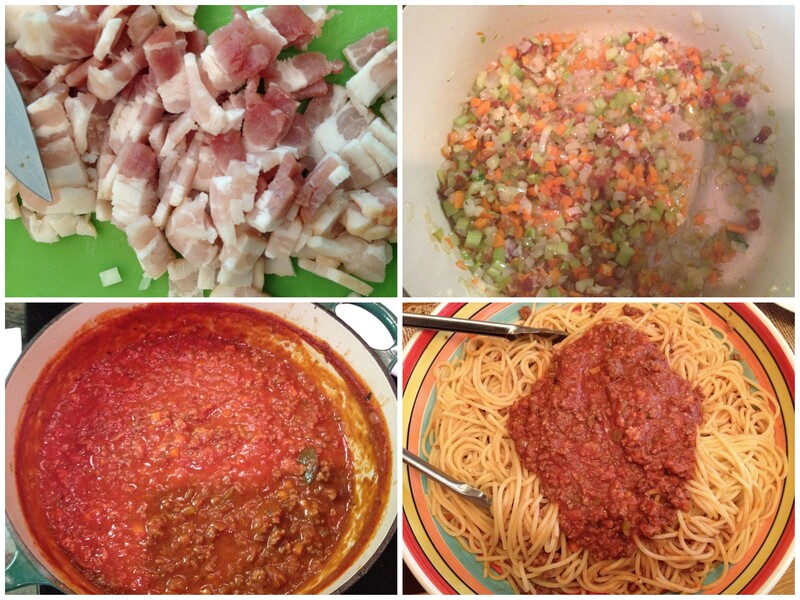 After you crisp up the bacon, you saute a mix of onions, carrots, and celery in the rendered bacon fat (YUM!). This dish does have a lot of steps, but once they are done you can just let it simmer and smell your whole house up with deliciousness. 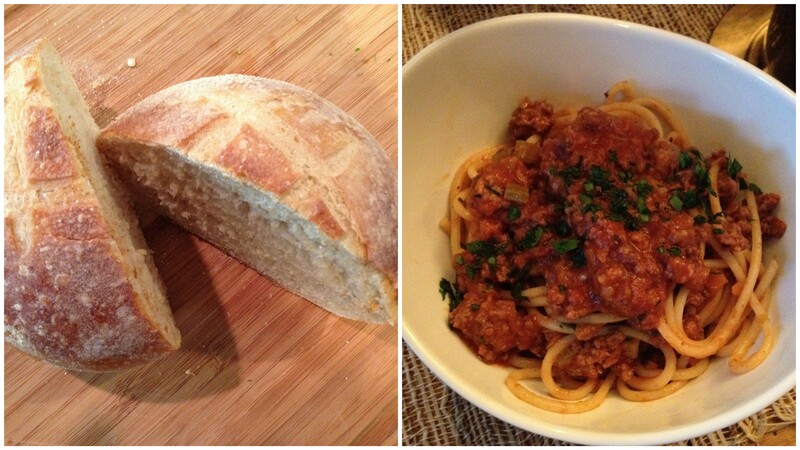 Don’t forget crusty bread…or good wine. 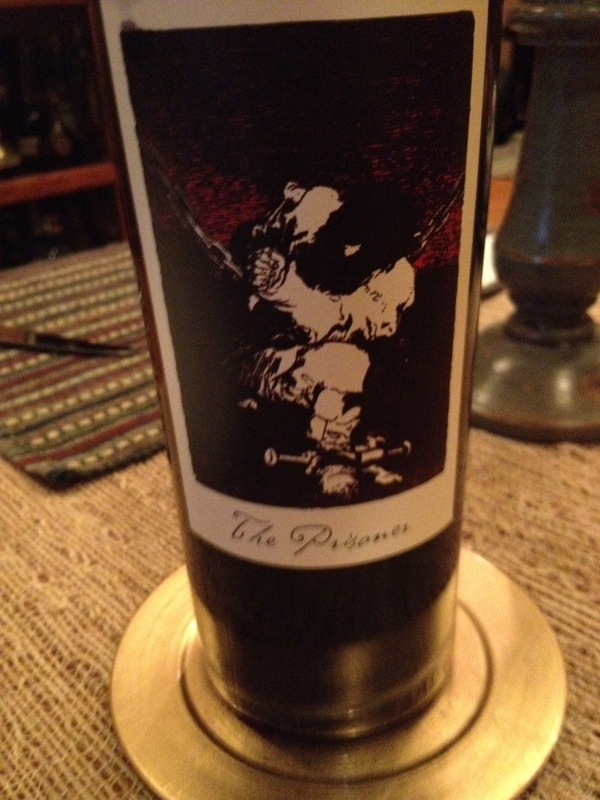 In this case, a fabulous Zinfandel from Orin Swift called “The Prisoner”. This recipe serves 8 (with 2 pounds of pasta) or 4-6 with one pound and left over sauce to save/freeze. In a large pot, heat the oil over medium-high heat. Add the bacon or pancetta and cook, stirring, until browned and the fat is rendered, 4 to 5 minutes. Add the onions, carrots and celery and cook, stirring, until soft, 4 to 5 minutes. Add the garlic, salt, pepper, bay leaves, thyme, oregano, and nutmeg and cook, stirring, for 30 seconds. Add the beef, pork, and veal, and cook, stirring, until no longer pink, about 8 minutes. 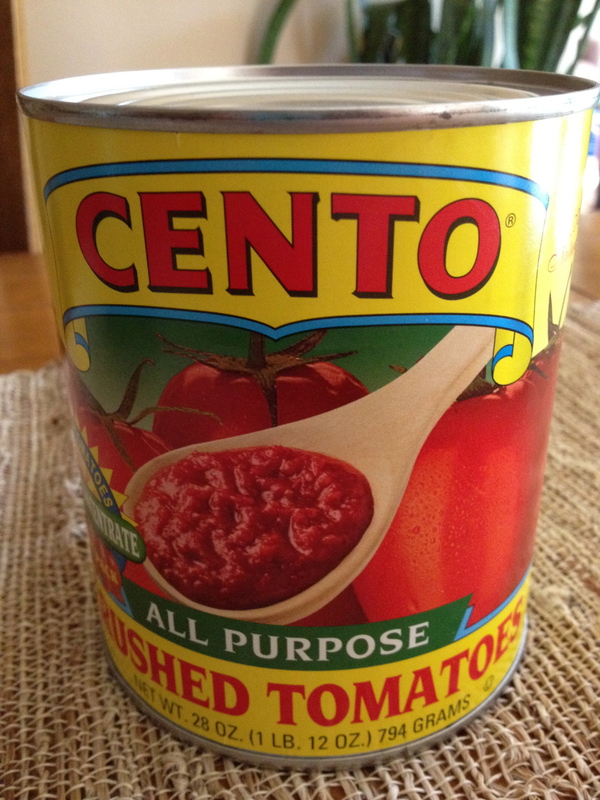 Add the tomato paste and cook, stirring, for 1 to 2 minutes. Add the wine and cook, stirring, to deglaze the pan and remove any browned bits sticking to the bottom of the pan, and until half of the liquid is evaporated, about 2 minutes. Add the can of crushed tomatoes, beef broth, and sugar and bring to a boil. Reduce the heat to medium-low and simmer (uncovered), stirring occasionally, to keep the sauce from sticking to the bottom of the pan, until the sauce is thickened and flavorful, about 1 1/2 hours. Add the half and half or milk, stir well and simmer for a couple more minutes. Discard the bay leaves and taste for seasoning, you may need a little more salt depending on the type of broth that you use. Remove from the heat and cover to keep warm until ready to serve. Meanwhile, bring a large pot of well-salted water to a boil. Add the pasta and return the water to a low boil. Cook, stirring occasionally to prevent the noodles from sticking, until al dente, 8 to 10 minutes, then drain put back in the pot or in a serving bowl. Add a cup or 2 of the sauce to the pasta, tossing to coat. Top with chopped parsley and serve with extra sauce and cheese.